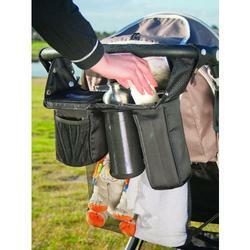 The Stroller Caddy is the newest innovative universal accessory from Valco Baby. It features two large insulated pockets to keep food or drink bottles cool or hot as well as two bonus Freezer Gel Packs, which fit neatly at the bottom of each insulated pocket. There is also a central mesh pocket for a drink bottle, a little mesh pocket for small items such as house keys or mobile and a generous mesh net bag great for larger items. Compatible with most single and twin stroller. List of compatible Valco strollers: single and twin tri mode, single and twin zee, single and twin spark and single snap and Snap 4. This accessory is universal and will fit on most prams and strollers.